"I am not a big runner but thought that the virtual run would be something I would try. It was very easy to sign up and run when I was ready to do it. The medal is great quality and I received it within days or completing the run and submitting my finish time." "Loved doing this virtual run celebrating Gardield’s 40th and benefiting a great cause!" "Great to participate in such a fun walk from so far away"
"Shipped quickly, super cute high quality medal & the patch looks great on my race bulletin board." "Garfield's Halloween is my absolute favorite holiday cartoon, so when I saw there was a race, I had to do it. The medal and shirt are great. Arrived quickly after the shipping date and was packaged well. I love the medal! I'm so happy I bought this. You definitely won't regret ordering." "Medal is beautiful & I got it in record time!" "great service and quality t-shirts as well as medals. This got motivated to start running again after I tore my ACL. No knee issues except for downhill so I had to walk that part. I will do this again :)"
"In the words of grumpy cat- this medal and sticker pack was just aweful- now what? (Loves them- great!)" "I love the Grumpy Cat Virtual. Such cute medal and Raw Threads has such cute designs to go along with it!!!" "I love the medal. The service was quick. 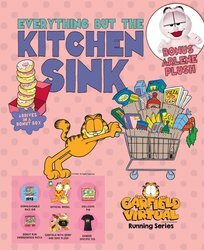 I hope you keep doing Garfield runs. :)"
"Easy no pressure incentive to get back into running!" Would you like to make an additional donation to the Pet Alliance of Greater Orlando? "My kitter Flower loves her Grumpiest 5K Pet Tag! :cat:"
"I love these virtual races. The box was filled with great goodies. One of the best Virtual Race packs I have received." "items shipped quickly, with no problem, thanks!" "This virtual race was the easiest I've done, mostly because it's the shortest. Great medal!" "This virtual medal is for all the times when you've wondered why you're up at o-dark-thirty, staring at yet another stretch of pavement, listening to your muscles complain, and wondering whether that participation medal is really worth the sweat. It's well designed and manufactured, and is taking pride of place on my medal rack"
"Came on time, medal is so cute and I had a fun time running!" "I'm not a runner and never thought I could even walk a 5k, but your races are so much fun! Both the medal and the shirt are quality and I've already signed up for your other two races. Please have more! You've made an exerciser out of this couch potato!" 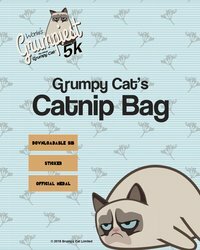 "I love the medal for the Grumpy Cat 5k! It's adorable and a great addition to my medal collection! The added pins and other swag found in the Chow Box are phenomenal. LOVE Grumpy Cat!" 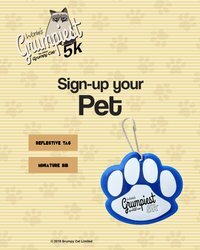 "I am so excited that my pup will get to do a Virtual 5k with me! This is such a fantastic idea! Love the medal as my pup will be able to wear it on his collar with no problem since it is lightweight." "I received my medal very quickly. It looked exactly the images and was way more than I expected. The lanyard had tons of different grumpy cat faces! Will definitely participate in future events!" "I ordered the Grumpy Cat event and it was in the mail to me the next day. I received processing notifications to let me know when it was sent and when it was delivered. I appreciated the service." 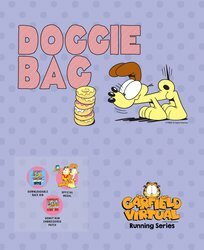 "The chow box and it’s contents are adorable! I’m excited to do my virtual 5k!" "The medal was wonderful quality and I adored the stickers. I’m not a big virtual race fan as I like the atmosphere of a real one, but run with character truly delivers! I will be doing more. :) happy running!" 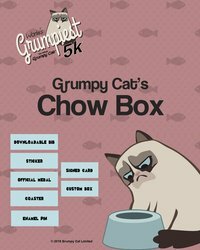 "The Chow Box came packed with precious loot full of Grumpy Cat personality!!! After my run, I hung the medal front and center on my medal rack because it is truly all.my.feels about running!" "It was great and so cute."